The scent is clean, camphor-like and fresh. The natural occurring thujone contributes notes reminiscent of dalmation sage. Western Red Cedar Essential Oil is nourishing to the skin. * This oil is not to be confused with the bark-derived Canadian red cedar, which is also Thuja plicata. Western red cedar is different from Canadian red cedar. Western red cedar oil is clear. It can be used as an alternative to mothballs by adding to wood chips or cotton balls and placing in closets or dressers away from clothing. 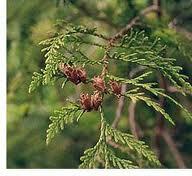 Uses: Western Red Cedar may help with hair loss, is nourishing to the skin, rheumatism, warts and psoriasis. It has powerful effects on the subconscious and conscious mind. Historical Uses: The Western Red Cedar has been referred to as the "Tree of Life". It has been used by ancient civilizations to enhance their potential for spiritual communications during rituals and other ceremonies. It has also been used for coughs, fevers, intestinal parasites, cystitis and venereal diseases. Aromatherapy Effects: It is calming and may enhance spiritual awareness and mediation. How to use: Diffuse. Apply to Vita Flex Points and directly on area of concern. Safety: For topical use only. Due to its high Thujone content, use sparingly and dilute with pure carrier oil. Western Red Cedar Essential Oil works great as an alternative to mothballs by adding to wood chips or cotton balls and placing in closets or dressers away from clothing.